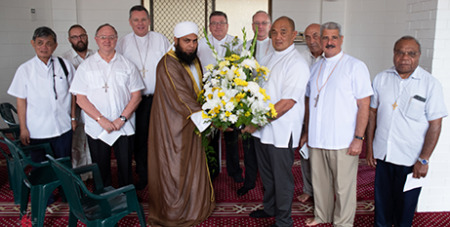 The Federation of Catholic Bishops Conferences of Oceania took time out of a meeting in Townsville this week to visit the local imam, pay their respects and deliver a statement of support following last week's Christchurch terrorist attack. The attack on mosques in Christchurch was particularly close to the Bishops of Oceania as one of the executive members is Christchurch Bishop Paul Martin, who due to the events was unable to attend the meeting in Townsville. During the visit Imam Abdul Salik spoke passionately of the communion that all religions have. “I feel honoured that you are here, we feel that we are not alone after this event in Christchurch,” he said. After, the bishops had an opportunity to pray with the Imam, he invited them to stay and enjoy a cup of tea with him in the mosque.